15 December 2008: The striking, large spiral galaxy NGC 1232, and its distorted companion shaped like the greek letter "theta". 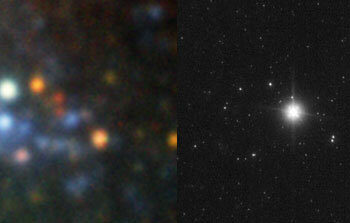 The pair is located roughly 60 million light-years away in the constellation Eridanus (The River). Billions of stars and dark dust are caught up in this beautiful gravitational swirl. The blue spiral arms with their many young stars and star-forming regions make a striking contrast with the yellow-reddish core of older stars. This image is based on data acquired with the 1.5 m Danish telescope at the ESO La Silla Observatory in Chile, through three filters (B: 900 s, V: 400 s, R: 400 s). 4 November 2008: M1-67 is the youngest wind-nebula around a Wolf-Rayet star, called WR124, in our Galaxy. 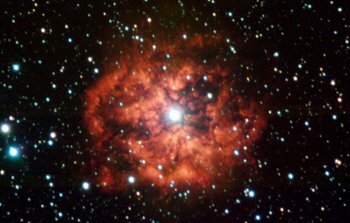 These Wolf-Rayet stars start their lives with dozens of times the mass of our Sun, but loose most of it through a powerful wind, which is ultimately responsible for the formation of the nebula. Ten years ago, Hubble Space Telescope observations revealed a wealth of small knots and substructures inside the nebula. 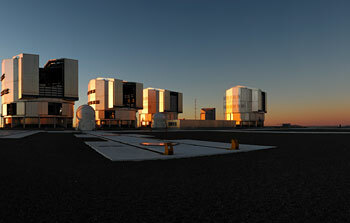 The same team, led by Cédric Foellmi (ESO), has now used ESO's Very Large Telescope (VLT) to watch how these structures have evolved and what they can teach us about stellar winds, their chemistry, and how they mix with the surrounding interstellar medium, before the star will eventually blow everything away in a fiery supernova explosion. The image is based on FORS1 data obtained by the Paranal Science team with the VLT through 2 wide (B and V) and 3 narrow-band filters. 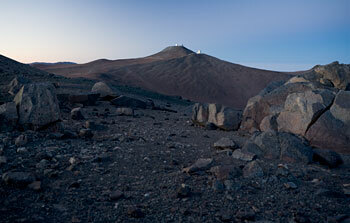 30 September 2008: A night of work for the Paranal Observatory, in the Chilean Atacama Desert. This picture, taken on 20 September, shows the incredible beauty of the night sky above the most advanced telescope in the world, ESO's Very Large Telescope. The Milky Way is clearly seen in this superb image. 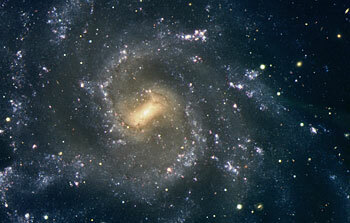 22 September 2008: Composite colour-coded image of another magnificent spiral galaxy, NGC 7424, at a distance of 40 million light-years. It is based on images obtained with the multi-mode VIMOS instrument on the ESO Very Large Telescope (VLT) in three different wavelength bands. The image covers 6.5 x 7.2 square arcminutes on the sky. North is up and East is to the right. 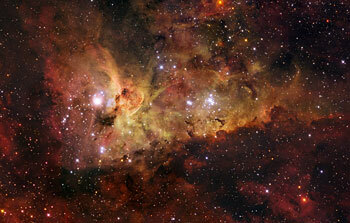 Read more about this superb object in the ESO Press Release eso0436. 21 August 2008: Colour-composite image of the globular cluster NGC 3201, obtained with the WFI instrument on the ESO/MPG 2.2-m telescope at La Silla. Globular clusters are large aggregates of stars, that can contain up to millions of stars. They are among the oldest objects observed in the Universe and were presumably formed at about the same time as the Milky Way Galaxy, in the early phase after the Big Bang. 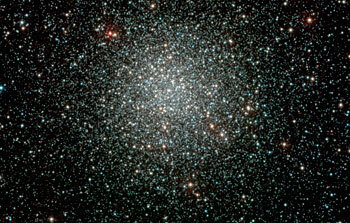 This particular globular cluster is located about 16 000 light-years away towards the Southern Vela constellation. 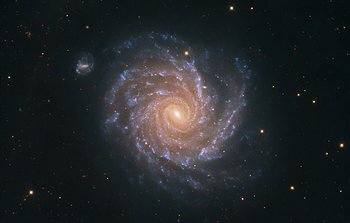 The data were obtained as part of the ESO Imaging Survey (EIS), a public survey being carried out by ESO and member states, in preparation for the VLT First Light. 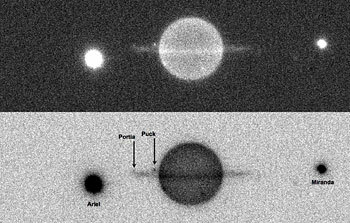 The original image and astronomical data can be retrieved from the EIS Pre-Flames Survey Data Release pages, where many other nice images are also available. 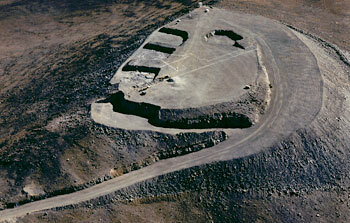 7 August 2008: Paranal, the site of the VLT, was chosen for its unique characteristics: extreme dryness, very low cloud coverage, high altitude, and distant from any source of pollution. 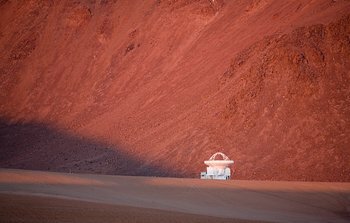 This wide-angle shot of the Atacama desert around Paranal, which shows the VLT and, in foreground, VISTA, summarizes it all. 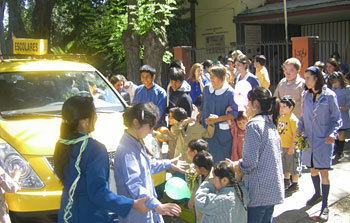 Photo taken in November 2007. 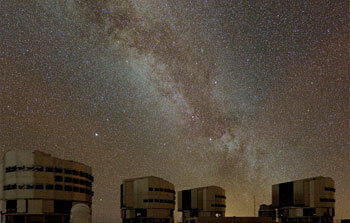 30 July 2008: The "Very Large Telescope Video Collection 2008" features High Definition video material which was obtained in June 2008. For the first time, ESO distributes HD-footage of the world's most advanced ground-based observing facility and provides free access to video sequences of outstanding technical quality and beauty. The material has been edited especially for broadcast use, without commentary or music. 17 July 2008: The first successful movement of an ALMA antenna took place at the Operations Support Facility (OSF) on 8 July 2008. The antenna transporter "Lore", one of the two units manufactured by Scheuerle under contract by ESO and delivered recently at the OSF, has been used to move one 12-m antenna from their site erection facility to an external antenna pad for sky testing. 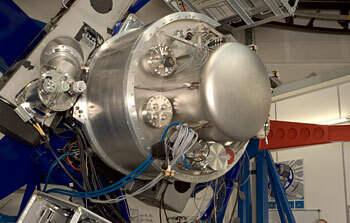 1 July 2008: The image shows X-shooter, the first of the second generation VLT instruments, under test in the integration lab at ESO, Garching. The instrument has been built by a Consortium including ESO and institutes from Denmark, Italy, The Netherlands and France, and will start operation at the telescope in 2009. X-shooter is a single target, wide band, intermediate spectral resolution spectrograph, designed to get the full spectrum of the faintest cosmic sources from the atmospheric cutoff in the near-ultraviolet to the infrared K-band in a single exposure. In this image the instrument is shown as mounted on a telescope Cassegrain focus simulator, pointing at a large zenith distance. At the centre is the cryostat with the near-infrared arm of the spectrograph and at the left is the lower side of the visual spectrograph with its CCD detector. The two large boxes on the sides host the control electronics of the instrument. 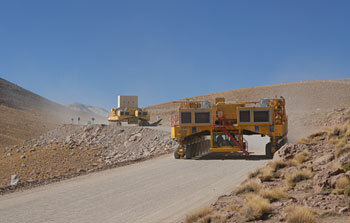 23 June 2008: The winding road connecting the ALMA Operation Support Facility at 3,000m altitude to the Array Operation Site (5,000m high) passes an area between 3500m and 3800m dominated by large cacti (Echinopsis Atacamensis). These cacti grow on average 1cm per year, and reach heights of up to 9m. 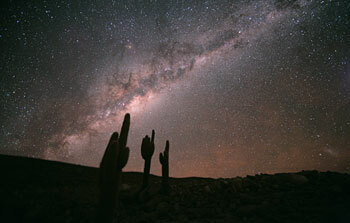 Stephane Guisard recently captured the beautiful sky above this unique location in the Chilean Atacama Desert. 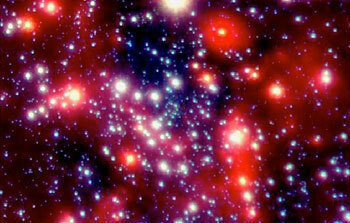 The Milky Way is seen in all its glory, as well as, in the lower right, the Large Magellanic Cloud. 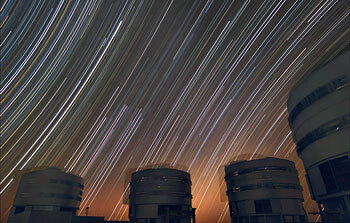 26 May 2008: The rotating sky above ESO's Very Large Telescope at Paranal. This long exposure shows the stars rotating around the southern (left) and northern (right) celestial poles, the celestial equator being in the middle of the photo — where the stars seem to move in a straight line. The motion of the VLT's enclosures are also visible. 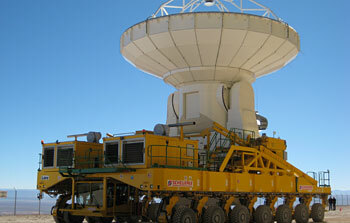 13 May 2008: Heavyweights at 4,000 metre altitude: this photo shows the two ALMA antenna transporters during the final phase of the acceptance testing in April on the road between the ALMA OSF at 2,900 metre altitude and the AOS at 5,000 metres. The first transporter ("Otto") is travelling unloaded, while the second one ("Lore") is carrying the 115-tonne antenna dummy.